COME AND COMPARE.There’s a lot to choose from in Quinns Rocks but make sure you don’t miss this one. VALUE FOR MONEY!! This large 4 bedroom 2 bathroom has been completely re-furbished and you can move in with nothing to do. The main bedroom with ensuite is situated separately to the minor bedroom enhancing the appeal of a family home. 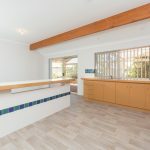 There is a separate formal lounge and dining room leading through to an extra large living area encompassed with the kitchen, featuring a freestanding breakfast bar/servery. You have to view this property to appreciate the vast areas that would make for comfortable family living. Positioned close to several schools and shopping centres you’ll be spoiled for choice. Also there are several parks in the area to choose from and the beach is not far away either. This property is well priced to sell quickly. Neat and tidy presentation leaves nothing for you to do but move in. Easy care gardens will allow plenty of time to enjoy what Quinns Rock and the surrounding areas have to offer. Situated in a no through road, come along and see the benefits living on Buffett Ramble will provide, I’m sure you’ll be pleasantly surprised.